Radius is committed to meeting the needs of its employees and clients with disabilities by removing and preventing barriers to participation whenever possible. We are committed to meeting the requirements of the Accessibility for Ontarians with Disabilities Act (AODA). Outlined below is a brief summary of some of the initiatives that Radius has undertaken in support of this Act. Radius provides training to all its employees and volunteers on Ontario’s accessibility laws, in a way that best suits their duties and responsibilities. All staff review policies and procedures annually. Radius is committed to meeting the communication needs of its employees and clients with disabilities. Radius will provide information in accessible formats, and with communications supports as quickly as possible and at no additional cost when a client or employee requests them. This includes, but is not limited to; publicly available emergency information for clients, and policies and procedures for employees. Radius will also provide employees with disabilities individualized emergency response information when necessary. We will consult with people with disabilities individually to best determine their information and communication needs, when necessary. All job postings specifically state that Radius will make every effort to accommodate any needs of candidates under the Ontario Human Rights Code and the Accessibility for Ontarians with Disabilities Act throughout the recruitment process, upon request. Radius has established procedures for receiving feedback regarding customer service for people with disabilities, including verbally, by e-mail, in writing, or feedback/client complaint form. As of June 2016, all new content on Radius’s website meets Web Content Accessibility Guidelines (WCAG 2.0). Radius is working to meet these guidelines for its entire website by 2020. Our reception areas have been designed to accommodate the needs of clients and visitors who use wheelchairs. Our reception areas have accessible seating areas and the furnishings in the other areas are easily movable to accommodate clients with assistive devices, such as wheelchairs, walkers, etc. 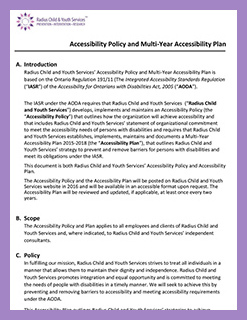 Radius Child and Youth Services is committed to meeting the needs of people with disabilities by preventing and removing barriers to accessibility and meeting accessibility requirements under the AODA.